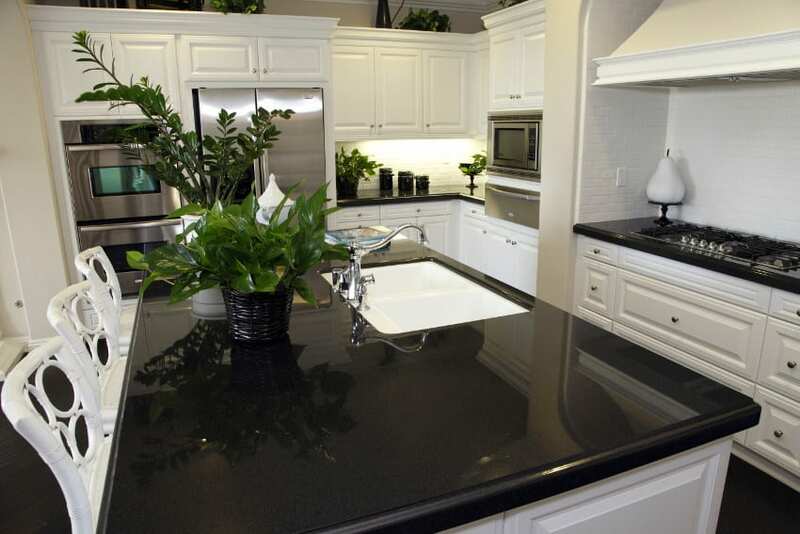 Quartz countertops are made from crushed quartz mixed with resins to bind the material together. Quartz is a crystal like mineral that comes in a variety of colors from clear, milky white and smoky grey to pale shades of purple, pale yellow and pale pink. Crushing quartz gives the resulting mix its colors and a multi-dimensional, faceted look. Pigments are added to the mixture to enhance and play up the natural colors of quartz. The result is even more colors variations or color combinations such as yellow and gold, green and blue, gray and black. While it is quartz – the color and structure of the quartz crystal – that gives a quartz countertop its natural beauty, it’s the resins mixed with the quartz that give a quartz countertop many of the characteristics that make it a good choice for the kitchen. The resins in a quartz countertop ensure that it has a naturally non-porous surface. This is a particularly important consideration for a kitchen counters as it is the non-porous surface that gives a quartz countertop built-in anti microbial properties. The resins also make the counters scratch resistant and stain resistant. The three most common “damaging” and staining cooking essentials – lemon juice, red wine, vinegar – are no match for the natural stain resistance of a quartz kitchen countertop. The resins mixed into the quartz make the resulting substance a lot more flexible than natural stone, this allows fabricators to bend and shape quartz. Quartz usually comes in slabs that are then cut into sizes according to what they will be used for. Compared to a natural stone countertop, a quartz countertop is relatively maintenance free. There is no need for periodic sealing or polishing. While quartz kitchen countertops seem like a very attractive choice, there are a few things you should consider before going out and getting one for your kitchen. A quartz kitchen countertop is pricy. It doesn’t just look like natural stone; it’s priced like it too. Depending on the manufacturer, a quartz countertop is priced at around $60 to 90 per square foot. If you are a big DIY fan, think twice before deciding to use quartz in your next home renovation project. Quartz is not a DIY friendly materials, it is very heavy and can crack if it is not properly handled. You’re probably going to need a certified installer if you want a quartz countertop in your home. They say if you can’t take the heat, get out of the kitchen and quartz is heat resistant. However, this is only to a degree. 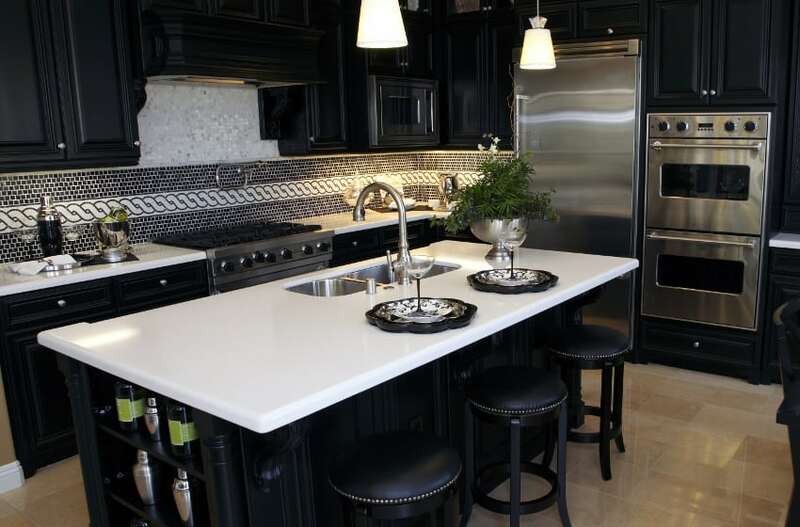 Most manufacturers will tell you that their quartz countertops can handle up to 400 degrees Fahrenheit. What does that mean for your kitchen countertop? No leaving a hot pot or pan directly onto your quartz countertop. You should avoid using scouring pads as they will dull the surface. Harsh chemical cleansers are also a no-no as they could break the bonds between the quartz and the resins. Lastly, quartz is an indoor material. 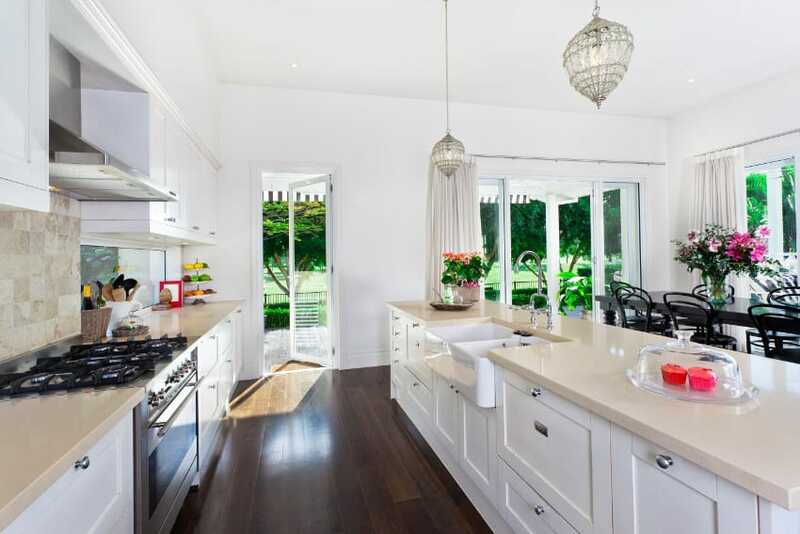 Direct sunlight can cause the colors to fade and the countertop to warp or split over time. So, no using quartz kitchen countertops in your outdoor patio kitchen. With all that said, you can see there are many reasons to consider installing quartz in your kitchen and enjoying all the beauty of this natural stone.